The Cleveland Cavaliers make only one visit to Madison Square Garden all season — assuming, ha-ha!, they don't meet in the playoffs — and that visit is tonight. 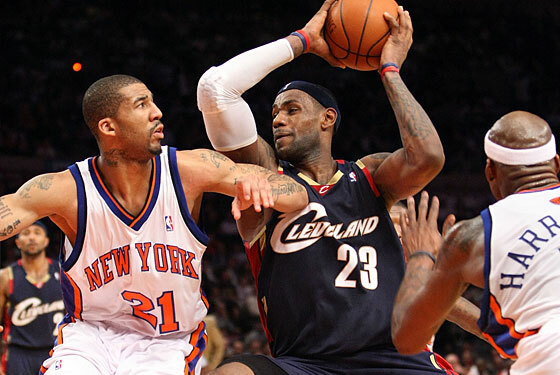 Which means this will be the last time LeBron James plays in the Garden while not wearing a Knicks uniform. Right? Right? The Knicks haven't exactly shown much that would impress Mr. LeBron so far this season, particularly the brutal loss to the previously winless Indiana Pacers on Wednesday. But it's not like the Cavaliers, 3–3 and looking discombobulated on offense, are blowing people away, either. Typically, when LeBron comes to town, he does something spectacular: Last year, he scored 52 points and left everyone all agog with envy. (It helps that he's always playing the Knicks, who aren't exactly defensive wizards.) This year, he comes in with Shaquille O'Neal in tow, a guy who has been known to have his fair share of fun with the Knicks as well. The game is one of the few nationally televised Knicks games all season — it's on ESPN at 8 p.m. — and you can expect countless Knicks jerseys with "James 23" pasted on the back. It's wishful thinking, sure. But that's all the Knicks really have right now. The best player in the world will be at the Garden tonight. Feel free to show him all the love you can. It's all we can really do.